Help us grow our team of supporters who care about fighting, preventing and ending homelessness…and are willing to pitch in and do something about it! Grassroots organizing is connecting supporters with policy makers in their own district, neighborhood and community – to advocate for better policy on issues effecting poor people and people experiencing homelessness in New York City. It’s the most effective advocacy of all. CFH Executive Director speaks to Politico about the growing number of homeless deaths in New York City. Read more here. Brooklyn Paper publishes a photo gallery with photos from CFH's 2017 Homeless Persons' Memorial Day. Click here to view the gallery. Global Citizen commemorates the lives lost while unstably housed in New York City in 2017. Read more here. Jay Dow, Pix 11 reports from 2017 Homeless Persons' Memorial Day; interviews CFH Executive Director, George Nashak and CAB member, Calvin Alston. Watch the full story here. AMNY announces the 2017 Homeless Persons Memorial Day Service to be held at LIU Brooklyn Campus. Read more here. Jeff Foreman joins advocates in testifying about the cities need to obtain information and increase services for the Runaway and Homeless Youth population in NYC. Read testimony here. In this Brooklyn Daily Eagle article, CFH Policy Director, Jeff Foreman, Dr. Helisse Levine and Dr. Edgar Troudt, both of LIU Brooklyn discuss the necessary steps New York City needs to take to end homelessness. The Institute for Children, Poverty, and Homelessness reported over 140,000 New York City school students expierenced homelessness over the past six years. Care For the Homeless Policy Director Jeff Foreman discusses the statistics in this New York Nonprofit Media article: Read the article here. Is the number of people homeless on New York City streets skyrocketing? Care For the Homeless Policy Director Jeff Foreman discusses the statistics in this Gotham Gazette article: Read the article here. Care For the Homeless Policy Director Jeff Foreman discusses the lack of New York City mayoral that discuss the issue of homelessness. Read more here. 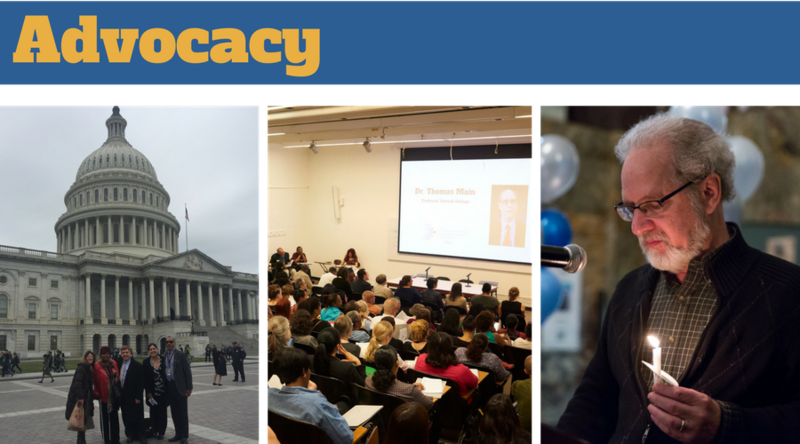 City and State highlights the Care For the Homeless Policy Forum on Preventing and Ending Homelessness Read more here. NYC Public Advocate, Letitia James said Albany needs to take "bold and brave steps" in order to end homelessness at our Policy Forum on Preventing and Ending Homelessness. Read more here. Care For the Homeless’ Policy Director Jeff Foreman and Policy Associate Nathalie Interiano, in partnership with the National Health Care for the Homeless Council, conducted a webinar about the Summer Solstice Success Celebration, an event that recognizes the incredible obstacles that people have overcome while homeless. Watch here. Jeff Foreman joins many other human service providers in testifying about the sector's need for significant across-the-board increase in funding. Read testimony here. WNYURadio speaks about the homelessness crisis facing New York City, featuring Care For the Homeless Policy Director Jeff Foreman. Listen here. Voice of America News about immigration and homelessness, includes Consumer Advisory Board members Philip Malebranche and Taje Singh. Read more here. Gothamist article about homeless deaths in 2016. Read more here. Gothamist article covering Care For the Homeless' and Urban Pathways' Homelss Persons' Memorial Day. Read more here. New York Daily News speaks about Homeless Persons' Memorial Day. Read more here. Harlem World Magazine covers Homeless Persons' Memorial Day. Read more here. Op-ed in Gotham Gazette about Homeless Persons' Memorial Day. Read more here. am New York announces Homeless Persons' Memorial Day. Read more here. Think Progress covers "Housing Not Handcuffs" New York City Campaign launch. Read more here. WMBC-TV news coverage of "Housing Not Handcuffs" Campaign launch. Watch here. Op-ed in Gotham Gazette features an article by Care For the Homeless Policy Director Jeff Foreman and Urban Pathways' Policy Director Nicole Bramstedt. Read more here. The Answer's Frank Morano interviews Care For the Homeless Policy Diretor Jeff Foreman and Consumer Advisory Board member Philip Malebranche. Listen here. Care For the Homeless' Summer Sosltice Success Celebration video by Fintan Mason featuring Human Resources Administration Commissioner Steven Banks.The event is held on the longest day of the year to celebrates housing, healthcare and advoacy successes of current or formerly homeless New Yorkers. Watch here. City Limits features an article by Care For the Homeless Policy Director Jeff Foreman about the possibility of ending homelessness. Read more here. The Gotham Gazette features an article by Care For the Homeless Policy Director Jeff Foreman on ways to fight, prevent and end homelessness. Want to be a CFH Homeless Advocate? Email Jeff Foreman at Policy@cfhnyc.org. Read more here. Incentivizing bank responsiveness to underserved communities? How many hours do you need to work to rent an apartment? Read the whole CFH testimony to Council here. Read our special report including how you can help. To read Executive Director Bobby Watts' correspondence to New York State Senator Neil Breslin, click HERE. To read Executive Director Bobby Watts' correspondence to United States Senator Kristen Gillibrand, click HERE. To read Executive Director Bobby Watts' address from Homeless Memorial Day 2012, click HERE. But We Actually Do Know How to Address Homeless Issues. Read Bobby Watts testimony to City Council here.